Hypertech Power Coils/Caps and Rotors - Dezod Motorsports Inc - Home of the automotive performance enthusiast since 2002. Any time you increase the voltage output of your vehicle’s coil you can expect to see more power and in most cases better fuel economy. The coil works in combination with your spark plugs to allow more spark energy into the combustion chambers of your engine. This allows better fuel burn and increased power. Hypertech’s Power Coil is capable of firing a street or slightly modified engine up to 7000 RPMs. Voltage gain over stock can exceed up to 57% more output depending on application. Stock coils usually average around 36,000 volts as compared to Hypertech’s coil kits that average between 45,000 and 55,000. Our coil kits include coil, brass terminals, cap and rotor. Nylon rotor hold-down screws are included to prevent misfire and our caps are made of high dielectric material to prevent carbon tracking. 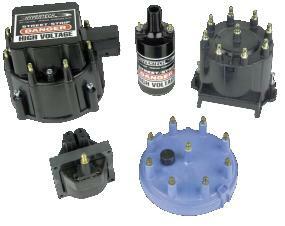 Each cap fits the distributor housing tightly to eliminate leakage. Installation is easy and no modifications are required.